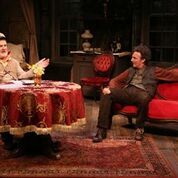 While theatergoers are rushing off to see Glenda Jackson in the title role of "King Lear" and eagerly anticipating the new play by Lucas Hnath starring Laurie Metcalf and John Lithgow may I direct your attention to a gem of a revival playing at the Irish Rep with some truly unforgettable performances. Sean O' Casey's "Juno and the Paycock" is one of the highlights of this current season. The Rep's last production another O' Casey play, "The Shadow of a Gunman" was a bit lethargic whereas this one is both funny and strikingly moving in so many ways. In Dublin in 1922 we first meet 'Captain' Jack Boyle (played with wry humor by Ciaran O' Reilly) who supposedly is unable according to him to work because of a severe leg problem. Yet, it seems that this affliction only comes into play when there is a job offering. While his levity is certainly fetching, his selfish behavior becomes upsetting and by the end of the play you find yourself having little respect--not that you had much to begin with--for him. He would rather go to the local pub with his equally hard drinking friend Joxer Daly (played with comic perfection by John Keating) then worry about how to pay the daily bills. The other major character is the angry brother Johnny Boyle (played with searing intensity by Ed Malone) who lost his arm during the Easter Week rebellion. Even more of a problem for Johnny is that he could have been an informant causing to the death of his friend Robbie Tancred. Like so many Irish plays those moments of happiness come to a crashing end. So, when the family supposedly inherits a large sum of money from Jack's deceased cousin and start to spend it even before it is in their grasp you know there is going to be a serious problem. There is another character who may appear minor but when you study the females in this play you become aware how strong O'Casey feels women are. 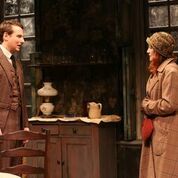 Maisie Madigan which is played superbly by Terry Donnelly lives in the same tenement (same set design by Charlie Corcoran as in "Gunman") is a widow who has given money to the Boyles seems like an easy going hard drinking woman (I loved her singing) until she realizes what Jack is really like. 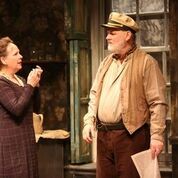 O' Casey has made the women in his play to be stalwart in their dealing with family calamities. While both sorrow and despair play a huge part in this play, the maternal instinct is inherent to keep things from completely falling into total despair The large and brilliant cast abetted by Neil Pepe's strong direction makes this one not to be missed. 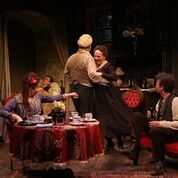 Tickets are available at the Irish Repertory Theatre 132 West 22nd Street or by calling 2112.727.2737.